Caption: Glen Ashlock (not shown in this photo) thought basketball was a sissy sport and ignored requests from a colleague to join a wheelchair basketball team. But his friend was relentless and Ashlock finally went to a practice -- just to watch and to tell his friend he wasn't interested. But he was hooked after that practice and has played for 12 years now. Read and comment on this story from the Columbus Ledger-Inquirer on Glen Ashlock who contracted polio while serving in the Peace Corps in Belize. The doctors discovered Ashlock had ingested a rare strain of polio while on a bicycling trip. The strain was rare enough that his polio vaccination didn't help. Glen Ashlock was having one of those bad nights that everyone has. He couldn't really sleep, his back ached and he tossed and turned the entire night. When he awoke the next morning, his right foot and toes felt cramped and the cramp moved into his calf. He shrugged it off and continued his work as a Peace Corps member in Belize. But as the day wore on, he felt worse and the back ache continued, so he saw a nurse. She just gave him muscle relaxers and told him to check back with her. The next day, Ashlock felt a weakness in both legs and his right leg would buckle on him as he walked. He'd fall to the ground. He went back to the nurse and they did tests. By the third day, Ashlock had no movement from his chest down, so they sent him back to the United States for tests. "They ran more tests on me than I ever knew existed," said Ashlock, 42. Finally, they decided to check for polio, a disease that has been virtually eradicated in the United States. The doctors discovered Ashlock had ingested a rare strain of polio while in either Belize or Guatemala on a bicycling trip. The strain was rare enough that his polio vaccination didn't help. "Some people win the lottery, I beat the odds with this," Ashlock said, shrugging off his misfortune. Ashlock has spent his week at the Roosevelt Warm Springs Institute for Rehabilitation, a place designed to help polio patients, but rarely used for that these days. Ashlock is a forward for the United States wheelchair basketball team which is participating in the six-team Roosevelt Invitational. The tournament began on Wednesday and concludes today with the semifinal, consolation and championship games. Games begin at 8 a.m. with the championship game at about 3:30 p.m.
Basketball is a sport Ashlock discovered after contracting polio. He played hockey as a youth, enjoying the physical contact of the game. "I liked sports where you could hit people," Ashlock said. "In hockey, my coaches would say, 'If you knock the guy down, he can't score.' So when I'd play pickup basketball, that philosophy would apply and people didn't like it." 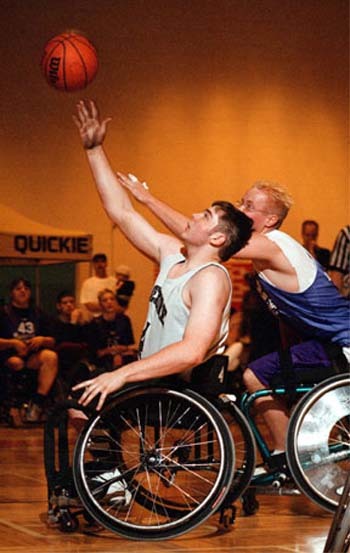 Ashlock thought basketball was a sissy sport and ignored requests from a colleague to join a wheelchair basketball team. But his friend was relentless and Ashlock finally went to a practice -- just to watch and to tell his friend he wasn't interested. But he was hooked after that practice and has played for 12 years now. Ashlock is proud to look down at his chest and see USA in bold, red letters. "It's a great experience to be on the U.S. team, very cool," he said. It was Ashlock's sports background that kept him pushing to walk again. In the 1950s, polio patients were given leg braces and arm crutches and encouraged to walk. Ashlock followed that prototype, pushing himself in a quest to walk. Ashlock wore braces to work, even though all it did was tire him. Doctors told him his legs wouldn't get any better, yet he still pushed himself. Ashlock has movement in both legs and can stand if he braces against something, but is always in a wheelchair these days. "It was good for me because if I hadn't done it, I would have always said 'What if I had pushed myself more. Could I have gotten better?' " Ashlock said. Ashlock splits his time between his work as a rehabilitation engineer and basketball. He plays on a traveling team in Michigan, where he lives. And he works to make life easier for people with disabilities using new technologies. On the court, Ashlock still resembles a hockey player, charging relentlessly at his opponents, unafraid of contact, hooked on the speed and skill of what he once considered a "sissy" sport. Only now, he knows better.